Welcome to the MadLab Engraving Department! 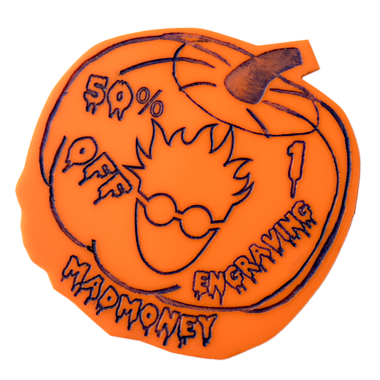 Bring it into the Wildcat Shop and get 50% off 1 engraving (does not include items for sale in MadLab)! We have a CO2 Laser Engraver that we can use to bring your ideas to life! We work by the motto: "Trust Your Crazy Ideas!" We can get a lot of other items and materials, but start with these catalogs, and if you don’t see what you are looking for, contact us and see if we can find what you need somewhere else! We are able to engrave on wood, glass, acrylic, marble, stone, anodized aluminum, cardboard, leather, and many other materials. Some materials and some colors will work better than others, but you are always welcome to ask us about your project. We carry engraving supplies in-house, so you can purchase frames, keychains, boxes, desk items and more directly from us to engrave. Or, if you have something of your own you would like us to engrave, bring it in and we will let you know what we can do and how much it will cost. These services are intended for faculty, staff, students, and alumni of Central Washington University. We will try to put more examples of past projects on this page, so please visit us again to see what MadLab has been up to! If you are faculty or staff and you need Public Affairs approved name tags, please use our online Name Tags Order Form.